Revenue management is a very fresh issue in the hotel industry. It basically sets out the right direction for maximizing revenue with the given budget possible. It is very important to set the right budget for valuable assets. It deals with setting the price on the basis of needs of consumers and not on the basis of production or supply. This report basically deals with the key concepts, critical areas of revenue management. Also we discuss how important the revenue management concept is and how to deal with the changing scenarios. 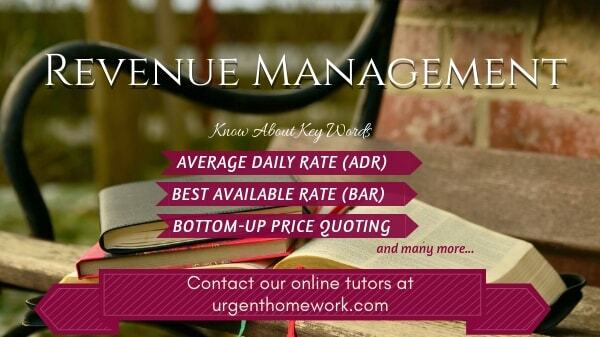 We also analyse how different situations and variety of customers lead to the changes in revenue management. Average Daily Rate (ADR) – Here the total room revenue is divided by the total number of rooms sold. ADR is one of the factor which tells how well the hotel id doing in terms of revenue generation. Best Available Rate (BAR) – It is the lowest rate available per available room for a given night. The BAR is another way to generate maximum revenue for that particular night. Bottom-Up Price Quoting- The cheapest or lowest available rate for the room is quoted by the hotel. This generally happens when hotel is not busy or is not expecting many guests. This can also happen during the lean season. Demand- It is the amount of a product or service that a customer is willing and able to buy for at any given price and any given time. Demand Drainer- This is an event or activity due to which the decreases the demand. Demand Generator- This is an activity or event that drives customers into a marketplace, like New Year parties. Differential Pricing- here the customers are charge differently for the same service depending on demand. Discounting- Hotel rooms that are offered for sale at rates below rack rate, rack rate being the published room rate. Forecasting- Forecasting is a future projection of estimated business. It is considered one of the most critical parts of revenue management. The over bookings, pricing, inventory control depends on the forecast. Occupancy Percentage (Occ%)- Is calculated by dividing the total number of rooms occupied by the total number of rooms available. Overbooking – it is a situation in which hotel books more room than available.The hotel over books to protect themselves against the possibility of no-shows and last minute cancellations. Rate Parity- Here the prices remains the same in all the distribution channels. Rev PAR- Refers to the revenue per available room and is calculated by dividing the actual room revenue by the number of rooms available. Top-Down Price Quoting- here the Guest Services Agents or the Reservation Team of a hotel quotes the prices of rooms and/or packages starting with the highest or most expensive rate available. Revenue Management was initially used in the Airline Industry but is applicable on hotels and resort industry as well as hotels as it is also considered as perishable product. Revenue Management is one of the proactive ways of maximising revenue of the hotel by selling rooms and other perishable products. Hotels are now widely considered as a perishable commodity, therefore making revenue management of utmost importance. As per Wikipedia the primary aim of Revenue Management is to sell the right product to the right customer at the right time for the right price. Revenue Management was once known as Yield management. The word yield means to produce or give forth an output or return and the term yield management means output management, when revenue management is applied to the rooms, the term means the management of revenue generation from rooms’ accommodation. Revenue Management includes wide range of opportunities to increase revenue in all the departments of the hotel. The hotel can utilize the different type of concepts for higher revenue generation however, not all can be used at the same time. The some of the concepts of Revenue management are Pricing, Inventory, Marketing and Channels. Pricing: Pricing is the foundation of revenue management, the customer decision to render the services and the product depends upon the pricing of that particular product therefore pricing is an important aspect of revenue management. The following questions to be kept in mind when pricing a product are how much to charge for a room depending upon location, demand, type of room, time of the year and the duration of the stay. For example, the tickets in the cinema hall are different for different days. Since they know that on weekends more people come to watch the movie, therefore the prices for the ticket are higher as compared to the week day. The first few weeks of the movie, the ticket prices are higher than at later stage. This tells that it is not only the hotels put all the perishable commodities follow the same pricing rule. There are different pricing concepts like- single rate pricing where the room rate is same for all days and all types, for example, the small budget hotels or motels, there prices remains the same for all the rooms, nevertheless of season or demand. Cost based pricing: here the hotel works out the actual cost of the product and services. This type of pricing is generally used in food and beverage department. For example, the food cost is calculated for each dish in the menu, it is only after that the hotel decides what extra money to be charged per dish so that it can generate revenue. Demand based pricing: here the prices are decided keeping in mind the demand in the market. For example: the number of room requirements during Olympics is more therefore the room rates are increased so that maximum revenue can be generated. Value based pricing: here the prices are perceived by the customer therefore the hotel has to relate to the same pricing so that the customer feels that they are getting the product in full value for money. The best example is the packages that hotel floats during weekends and during season time. Competitive based pricing: this is generally followed by free standing hotels. Inventory: Here the room management is mainly concerned how to charge the best possible rate and allocate the rooms to the guests. The hotel can decrease the rates to increase the business volume; this helps the hotel to gain the market share. To increase the revenue, the hotels have started the different reservation policies like overbooking, charging the no show guests and late cancellation fees. The best example is, hotels during the season time, take over bookings based on the last year experience and the present forecast. Marketing: Marketing tools can help increase the profitability of a hotel through different price promotions and activities. Revenue management helps in maintaining the balance between the growth and profitability. For example, the marketing team gives out advertisements on packages, whereby increasing the possibility of people coming and buying the product. Channel: The distribution channels holds different rates according to the customer they are dealing with or we can say the distribution channels are price sensitive as customers who shop on line are sensitive. The hotel can take help of different distribution channels by allocating rates and certain rooms. The room sold through distribution channel tends to give confirmed business. The Sebel Heritage Yarra Valley is a 102 room property with a choice of room and a suite. It has two 18 holes golf courses which are world class. It also has three Food and beverage outlets namely Bella restaurant, Cafe Vitality and Lodge Bar. The other facilities include spa, indoor swimming pool, tennis court and a gym. The hotel is a part of Mirvac Hotels and restaurants. It is rated with 4.5 stars. Also, the hotel is located close to Melbourne and also some 80 wineries. During the analysis it was felt that the Yarra Valley hotel has included many pricing policies not only in rooms but also in food and beverage and recreation facility. Rooms Division: The Sebel Heritage hotel uses different distribution channels to sell the hotel rooms to the customer’s worldwide. They uses online websites, travel agents and nearby wineries for getting the business. The hot air ballooning business also helps them in getting the customers to the hotel. The hotel uses bottom up price quoting as they have lot of their guests who uses trip advisor for feedback on services and products of the hotel. The hotel follows price transparency. Apart from this, they also follow single rate pricing and value based pricing. Their room rate on a particular week day and also on a special day like Valentine Day is same. They do not follow demand based pricing. The single based pricing is not recommended in revenue management as the profitability is minimised. The hotel should follow the demand based pricing as it helps in boosting the revenue. Though, hotel follows value based pricing as they have extensive packages to offer to the guests like best available bed & breakfast rate, revive at mirvac, par and pamper, girls night in, stay and play and the Yarra wine and dine package. They have different kinds of packages to offer to all kind of their clientele and customer see it as full value for money. Food and Beverage: Since the hotel is located in the Yarra Valley, there is abundance of fresh fruits, vegetables, assorted meat products and dairy products in a wide range from the nearby farms. Bella restaurant is able to get stable revenue as their pricing is cost based; therefore the costing includes actual food cost, labour cost and other variable cost. The menu offers cheese selection for their guests. The cost goes up gradually, like if you have one cheese the cost is $12 AUD, two cheeses is $18 AUD and three cheeses is $26.This is basically an example of cost based pricing. The price of the cheese has increased as the prices have been added up to the actual cheese cost. Considerations here could have been the cost of the actual cheese, the delivery, the up keep and the labour for the chef to slice the cheese and so on. Golf: At The Sebel Heritage Yarra Valley there are two 18-hole golf courses that are available to either members of the Clubhouse or guests at the resort. The pricing strategies are similar to hotels as golf courses are also considered as perishable products. The demand based and value based pricing strategy is used here by the hotel to generate maximum revenue. Demand based pricing for the resort involves setting the price for a particular party of players by deciding on the following factors like time of day, day of the week, season of year and weather forecast of the date chosen to play. The price alters depending on the level of demand. Value based pricing is also available in the form of packages where the golf is a part of the package. Since the prices of golf are not visible on website, it becomes easy to include the same in the package. The Sebel Heritage Yarra Valley resort is very well located property with good choice of restaurants and also recreational facilities. Though hotel is doing well in terms of revenue but still the single based pricing is not recommended as the hotel has a potential to sell the rooms at different rates at different times. However, hotel’s value based pricing is highly commendable as it attracts more business. Revenue management is more complex than ever, but potentially more rewarding, too. It requires the whole organization to pull together, but the right Revenue Management implementation can really drive results, creating not just revenues but profits.Most practitioners accept that implementing. Revenue Management in a hotel can increase revenues 3-6%. Many have won much greater increases. Every hotel manager, operator and owner has a fundamental obligation to optimize the long-term profitability of the assets. Fulfilling this obligation can mean things like increasing rates during busy periods, dropping them during slower times to maintain occupancy (and keep staff working) or incurring expenses like a room renovation or investing in technology. Given the uptick in demand that the industry has enjoyed in the past year, one area of investment more and more hotel companies are evaluating is Revenue Management (RM). These hoteliers believe that they can drive increased profitability using RM tools and techniques. Implementing Revenue Management is no simple task. Some obstacles are technical, like the reliability of PMS data extracts. Other obstacles are cultural and organizational. Let’s examine some these challenges on both sides of the fence. Sophisticated hotels will evolve to one-to-one revenue management; each individual will be a market segment in them. In the future, technology will support calculating the total customer value and the potential total customer spend, based on history and future potential from demographics, to determine what rate and what availability to offer to a potential guest.